If you are considering a home or office security safe, look no further. We are pleased to Introduce the Quarter Master 7825 Electronic/Digital Home Office Security Safe by the Paragon Lock and Safe Co. It is perfect for the home, office, or work place. It was designed with the intent to be compact yet fully functional. The Quarter Master 7825 offers 2 options to open, code or key. We include a 10 Year Manufacturer Warranty. Features: Digital entry eliminates the need for making multiple key copies. Easy to operate and program. Larger and More Robust than the competition. Can be programmed up to 8 PIN numbers (digit codes). Opens with secret PIN code or included keys (lock is hidden from view). Constructed of 1/8" thick solid steel. Heavy-Duty chrome steel dual 3/4" pin bolt throw system (not just latch). Inside tamper-proof hinges. Hidden lock with two keys. Door measures 2" thick. Carpet padding on inside bottom. 2 pieces of 2 1/2" anchor bolts are included. Outside dimensions: 9 3/4" high x 13 3/4" wide x 9 3/4" deep. Inside Dimensions 8 3/4" H x 12" W x 8 1/2" D. Requires 4 AA batteries. Mount on Floor or Wall. 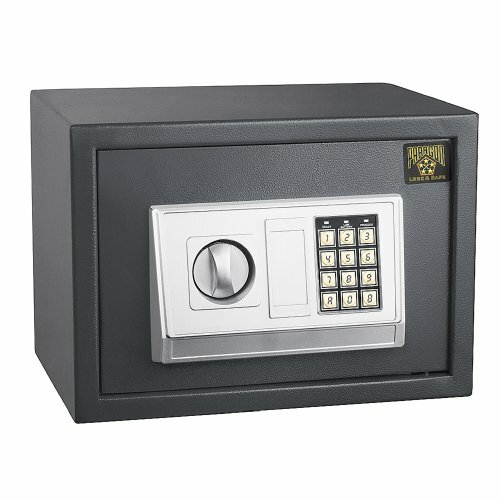 NOTE: This safe is not fire proof Dimensions and Weight: Outside dimensions: 9 3/4" high x 13 3/4" wide x 9 3/4" deep. Inside Dimensions 8 3/4" H x 12" W x 8 1/2" D. Weight: 25 lbs. Color: Dark Grey. If you have any questions about this product by Paragon Lock and Safe, contact us by completing and submitting the form below. If you are looking for a specif part number, please include it with your message.